Quinns: Oh my god. Where do we start? Maybe just gaze into the above image. Try and take it all in. Crystals! Robots! Colours! Cards! Three dozen unique kinds of token, each with a different shape, as if they were all so scared of this primary-coloured scrum that they started to collapse in on themselves. 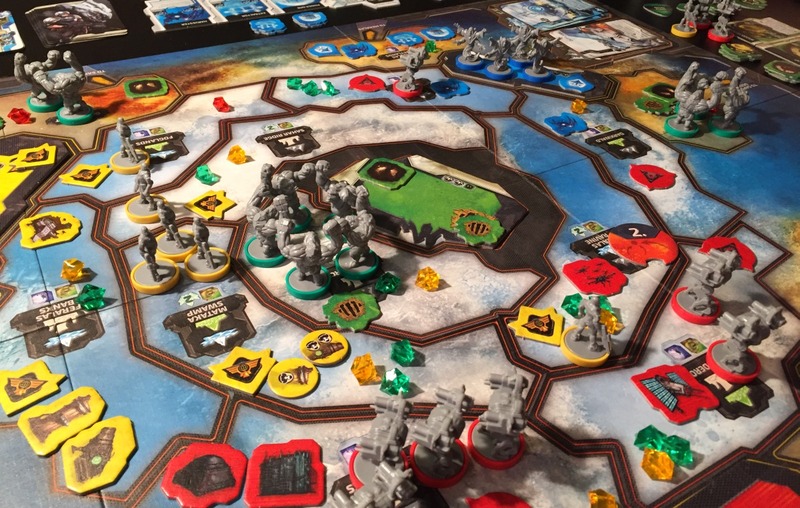 This is Cry Havoc, one of 2016’s most striking and well-received war games, and if you take anything from its Shakespearean name it shouldn’t be wry sophistication, but that this design is as wild and energetic as a pack of dogs. 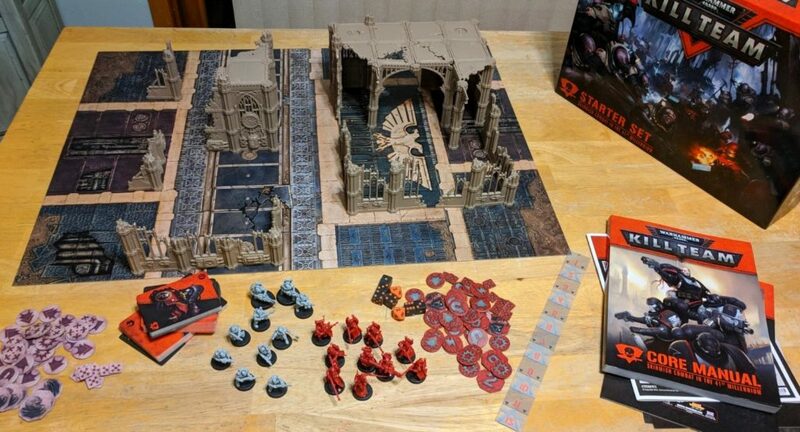 “Friends, Romans, countrymen, lend me your ears!” Let me tell you what I think of this grand box. That was another quote from Julius Caesar, you see. I might even do another before we’re done. Brace yourselves! 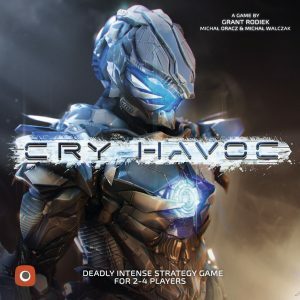 Cry Havoc is a dramatic proposition for an evening. 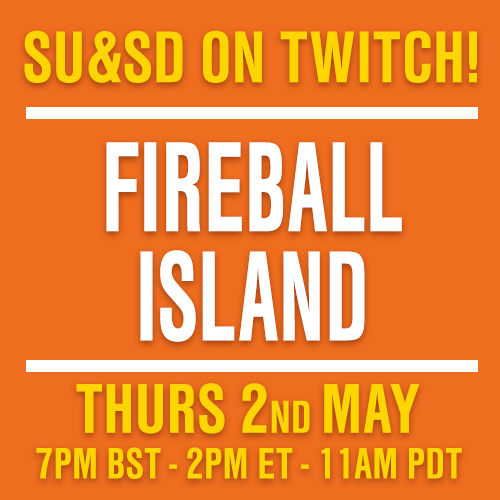 Two to four players each represent a different race battling for control of a planet containing (a) fabulous crystals that you all want, and (b) a race of troglodytes channeling Steve Holt from Arrested Development. 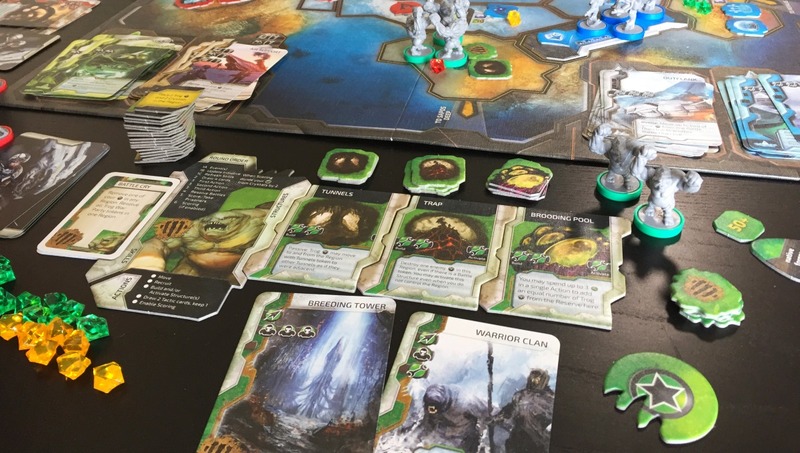 In a four player game someone actually plays the ‘Trogs’ that live here, leading to a fascinating opening set-up where three players all slowly creep out from their bases, but wherever they move both trogs and treasures explode out of the ground. That’s basically everything you know about the setting, which kind of charmed me with its vagueness. Why did you all arrive at the same time? Why do you want these crystals? There’s so much lovely art in this game but none of it tells you anything. It’s like the game of a 1980s sci-fi movie that nobody working at the publisher had actually seen, but none of them were willing to admit it. Even the guy on the front of the box is unrecognisable as any of the races from the game. Is he a robot? A human? An illustration that the publishers found on Deviantart? What’s he looking at? What’s the thing in the middle of his chest? Can I use it to charge my phone? Below you can see the start of a game. Everyone’s in their corner, waiting for the starting bell as if this were a Brobdingnagian boxing match. Your “boxing match” is going to last for five rounds, or about two or three real-life hours. Each round, everyone draws four cards from their deck, and then players can spend these cards to perform three actions. Moving is an action, shuttling your little miniatures from your “HQ” space out into the planet, usually trundling them into other players’ minis and starting battles because let’s not forget, the Trogs live here. Building more miniatures at your HQ is another action you can do, as is constructing & activating buildings in spaces that you control. 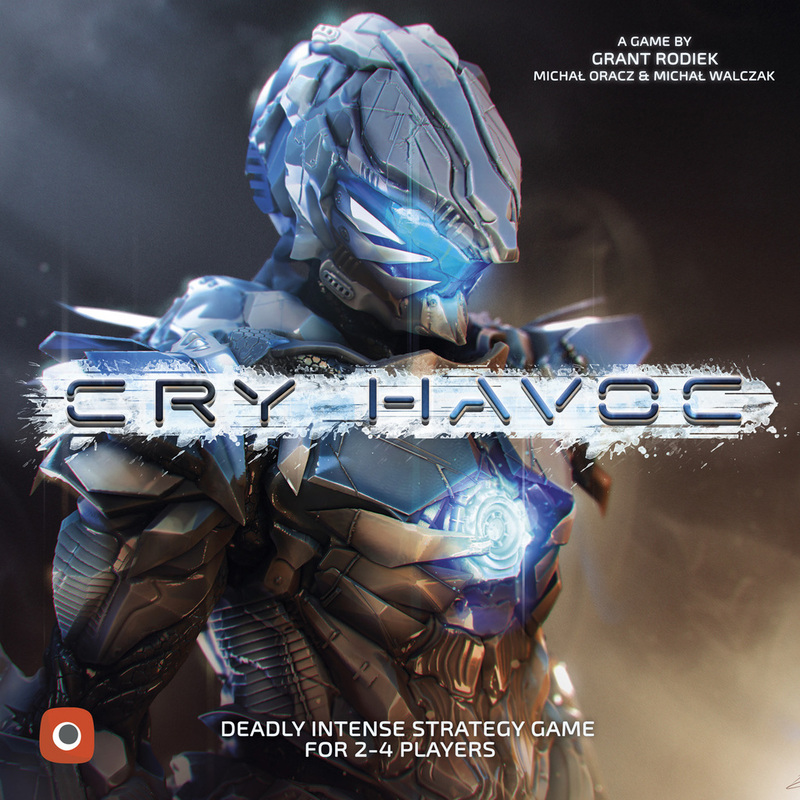 You win Cry Havoc by having the most “Victory Points” after five rounds, and players score one point for each crystal they control at the end of a round. So if your red robots are sitting on 14 crystals, you’ll score 14 points. The yellow humans want to control as much of the planet as possible. Using the revolutionary sci-fi technology of “an airport” they can claim spaces on the board where they don’t have miniatures, and they get extra victory points for each space they control, so they just want to paint the map in their colour. As well as having access to five thoroughly excellent buildings the Robots can trundle their buildings around the map, sliding their centre of power around the board like a thumb of butter in a frying pan (and also raising the semantic question of when a building is technically a robot). …The Trogs! Who are bad at everything but can be found everywhere on the planet in enormous numbers. In a two or three player game the trogs are a very dynamic environmental hazard. 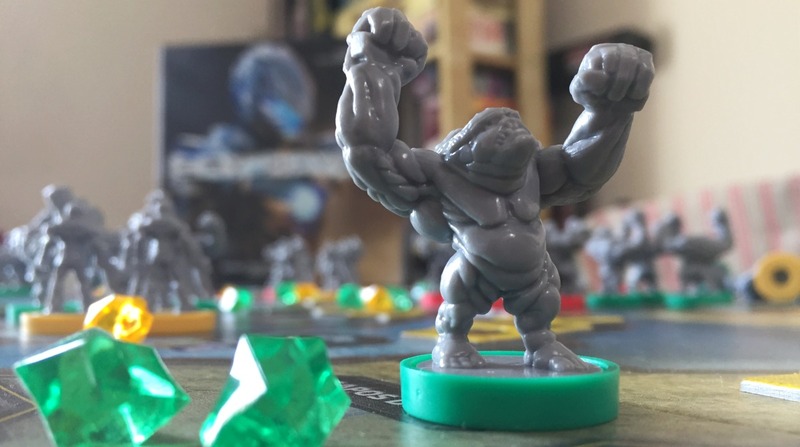 In a four player game, though, the player controlling the trogs is constantly repopulating and concentrating any trog tokens and crystals on the board like a homeowner trying to rescue their favourite possessions from three different house fires by setting more fires. 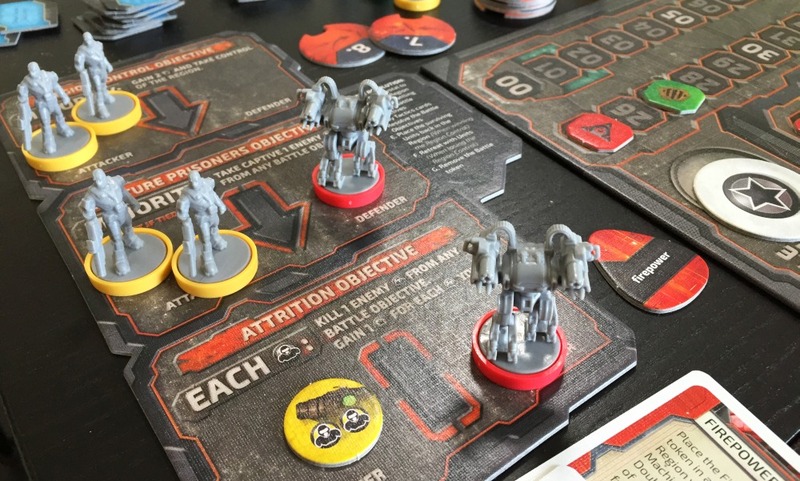 Players can then alternate playing “tactics” cards that let them shuffle these miniatures around as if they were playing musical chairs. Once this is done you resolve each box in a brutal bit of intercontinental admin. In the above example, from top to bottom, Yellow wins the region and Red has to flee, Yellow captures one of Red’s minis, and he’d definitely choose to capture the robot on that third “Attrition” box so that the robot doesn’t then kill one of the humans in the fight. …And at this point in the review I’m going to do some prioritising of my own. You see, I’ve only explained about 60% of the systems you’ll be trying to tease into a tidy strategy in Cry Havoc. 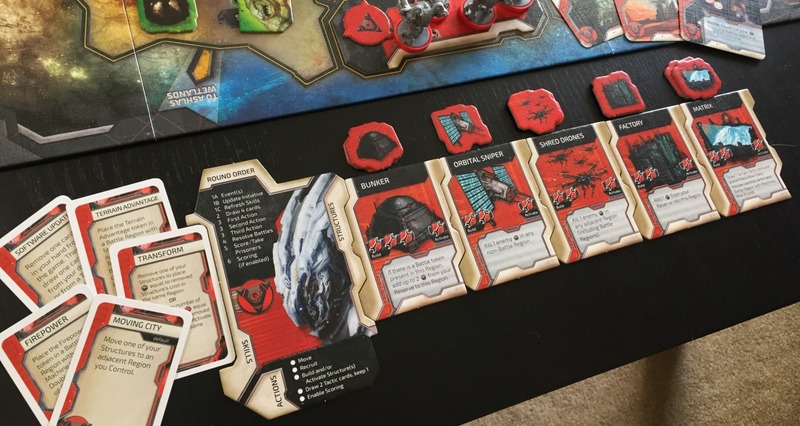 I could also explain drawing terrain cards to add to your deck, or activating the scoring phase, or the unique effect printed on every single building and skill card. But there’s not much point teaching you exactly how it all works because the point of Cry Havoc isn’t the cleverness in any of these systems. There’s nothing like the genius of the hidden rebel base in Star Wars: Rebellion, or the tricky drafting of Inis, or the joke of other players placing your objectives in Forbidden Stars. No. The point here is maximalism. In fact, owners of Cry Havoc will soon be able to buy even more skills and buildings in an expansion, Cry Havoc: Aftermath. Instead, the thrill of Cry Havoc is how much there is to discover, and to experiment with, and how it all feels good. Because defenders receive such a tremendous advantage in Cry Havoc and crystals spring up everywhere you go, simply taking territory feels satisfying. The cards are of lovely quality and mostly free of text, letting you focus on the grand, three-dimensional board. Even being attacked is fun because you can often snag a prisoner or kill off some enemies. But best of all, this game is a masterclass in how so many unique player factions feel fantastic. 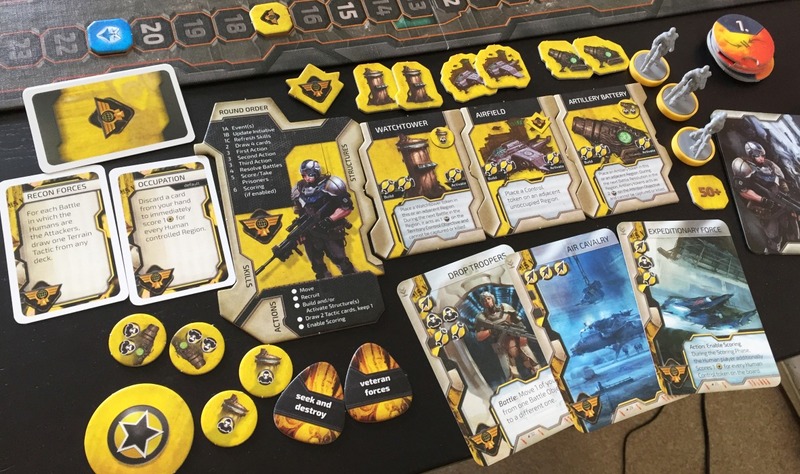 The balance that Cry Havoc strikes is that each faction has so many special powers that it feels like it’s your birthday, and daddy Havoc has given you a sack of gifts made from thick, heavily-illustrated cardstock. But vitally, every one of these powers is thematic, powerful and simple. That’s important because like a birthday, you want your friends to be invested in your special moments. 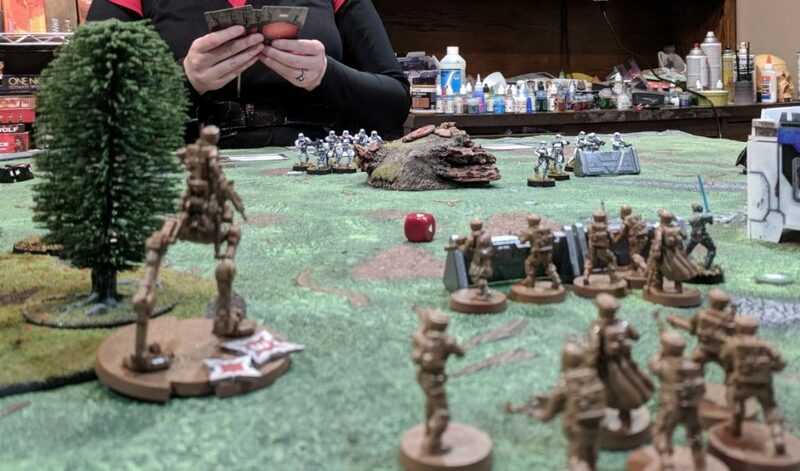 The times when I felt the most fondness for Cry Havoc were when I was watching the humans land drop troops on the other side of the board, or watching the trogs pour out of a hidey-hole, and thinking how cool my opponents were. And can I just say that I really like that Cry Havoc has just one miniature sculpt for each faction? So many war games give every player an entire playset of toys, regardless of whether it benefits the game. Having just one kind of toy soldier in Cry Havoc, with no competition and no complications, feels incredibly clean. When a mini comes onto the board, or dies, or moves, that moment is allowed to be immediate and dramatic. You don’t need to check what’s moving first. …But I can’t put it off for any longer. 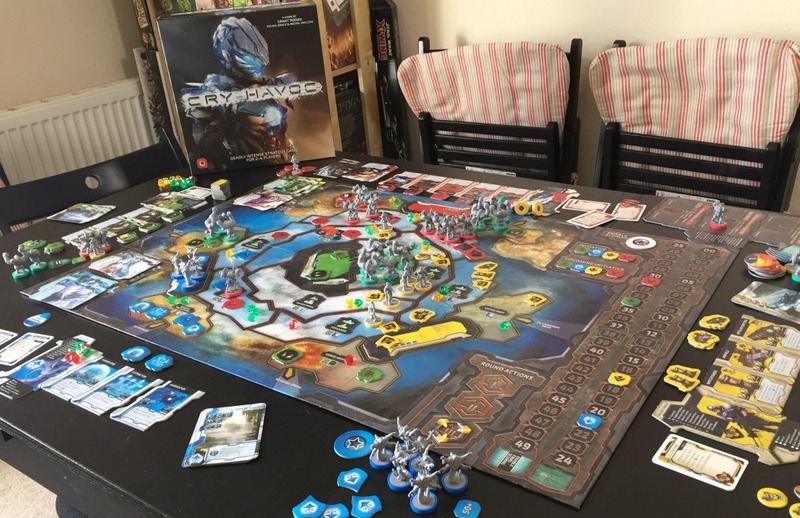 OK. You see, there’s a problem with Cry Havoc, and it starts to creep in at the periphery of your experience the longer you play it. So, think of it like a landscape. The wonderful abundance of asymmetry and ideas in this game means that when you buy the box or start playing, you’re going downhill. 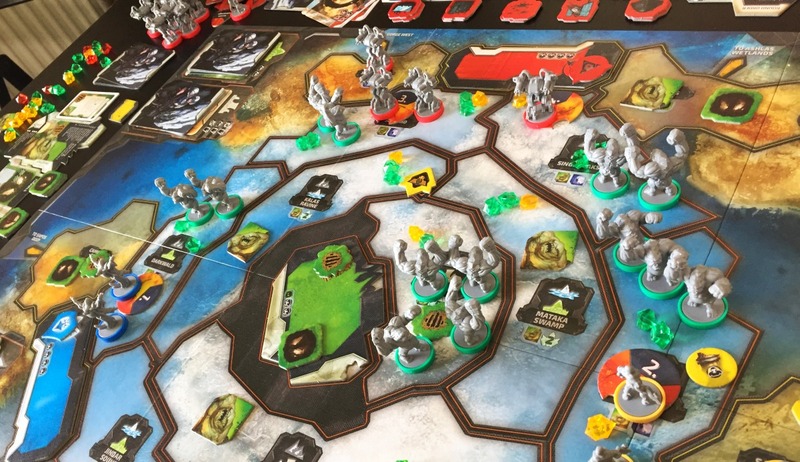 Cry Havoc is the most exciting game in the world. But if you want to try and calculate the best move you can make? This game immediately switches into an uphill struggle. Do you remember earlier when I said the fun of Cry Havoc isn’t answers, it’s systems? That’s great right up until you want an answer to the systems; taking into account all of the factors present in the game, what move should you make? Let’s say you have some cards with high movement and you’re deciding where to attack. You want to count up the crystals in all the areas adjacent to your soldiers, and the enemy soldiers in them, and check any buildings that are there. And you might want to ask the players how many cards they’re holding in their hand, and guess how many of those are tactics cards. None of this is quick, or fun. In fact, simply checking adjacency is a pain. The curving regions of Cry Havoc’s striking board start off quite counterintuitive and only get worse when you have miniatures and buildings at one end of a long, thin strip of territory. But it’s the tactics cards that I came to actually hate. 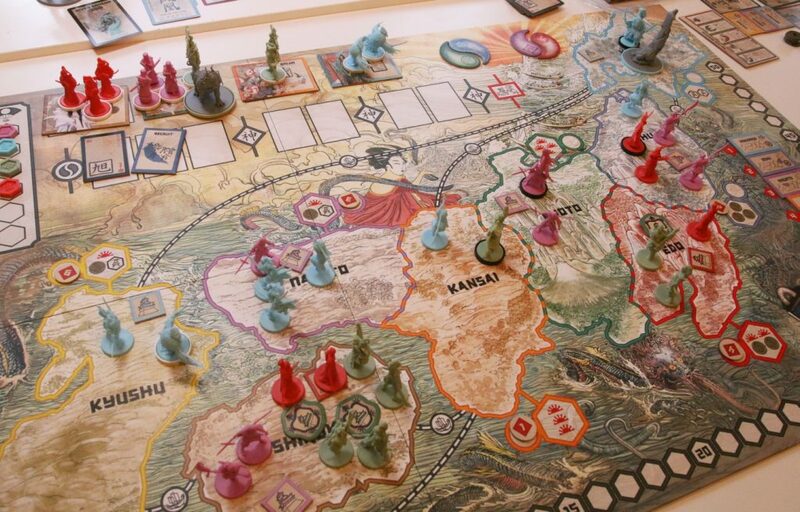 The placement of miniatures on the battle board demands a fair bit of consideration from the players, which slows the game down, and then all of the thinking that one or both players did can be vaporised by tactics cards that someone might be holding. The Victory Point system isn’t as unknowable as the combat, it’s just that you won’t bother doing the sums involved. To work out how well someone’s doing you have to add together all the crystals they’re parked on, plus their existing score, plus their race’s special point-scoring ability, and then do this again for each other opponent. It’s boring busywork that you’re unlikely to do (especially not if you want the game to stay pacy), but if you don’t do it then you arrive at the finish line like sticks racing down a river. The Humans won, followed by the Pilgrims, then the Trogs, then the Robots. Why? Well, you’ll definitely sit around discussing why you all think it worked out that way, but it’s that same problem again but writ large- an exciting system coming down to foggy guesswork. 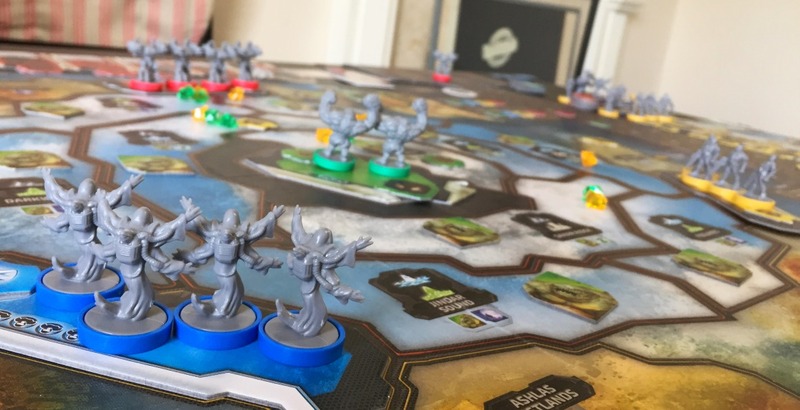 Ultimately, I guess it’s as simple as this: A board game should be a magical convertor that you pop down on your table, and you and your friends put energy in and get entertainment out. 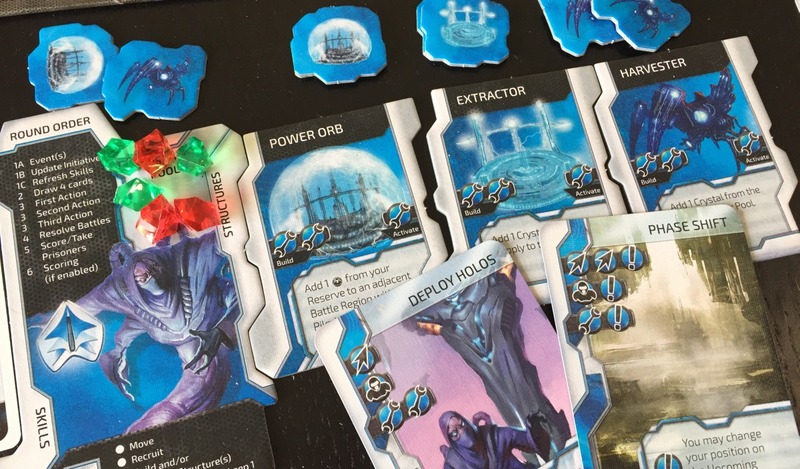 And as a machine, Cry Havoc is captivating, but sometimes grindingly inefficient. No-one I played it with had a bad time, but none of them would choose to play it again over some of this site’s favourite games. If we wanted fun, aggressive miniatures combat on a big board, we’d play Conan. 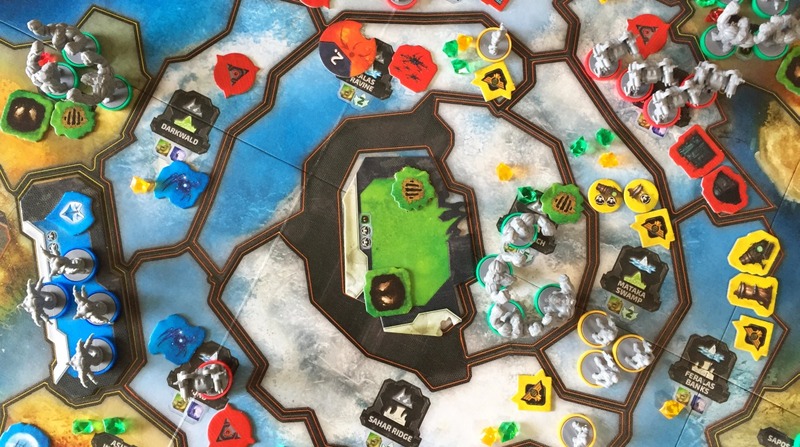 If we wanted an inventive, tactical game, we’d play Inis. 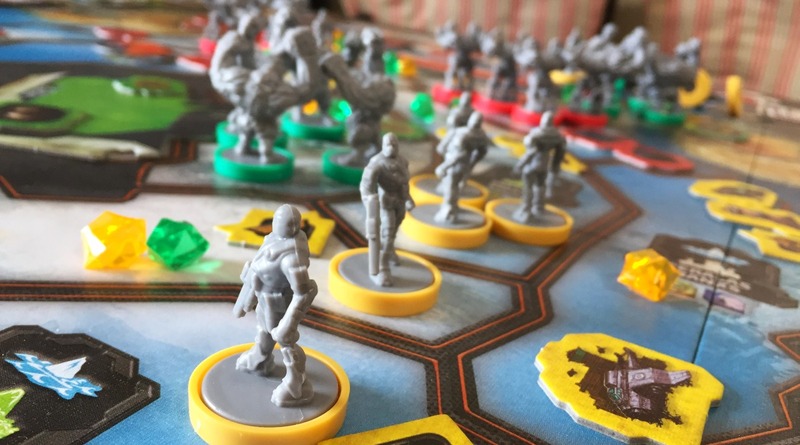 And if we wanted a strategic sci-fi epic, I’d dust off Eclipse, which remains a fantastic game. …And yet there’s something about Cry Havoc that means I can’t totally dismiss it. It’s no masterpiece, but it really is a wonderful distractionpiece. The beginning of the game is so exciting, and so full of possibility that makes me not want to stow this game up in my attic. I haven’t played the Pilgrims yet! I haven’t seen all the skills. It seems like such a shame.